There has been many commemorations and celebrations the past month. 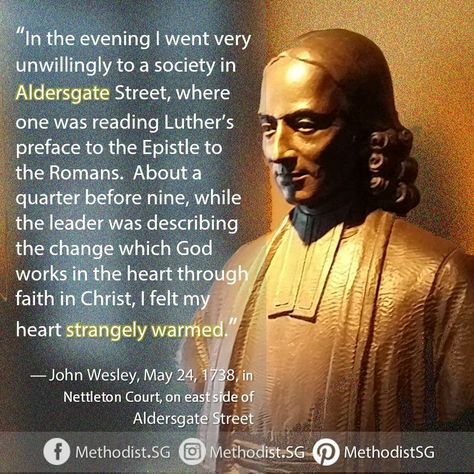 Wesleyans commemorate the 24th of May, as the day that John Wesley, the father of the Methodist Movement received assurance of his salvation. Our President writes an interesting article in this edition of the First Friday Letter. The Methodist Church in Fiji has also shared a commemorative video their communications department created for the occasion. During May we have also witnessed the killing of over 100 Palestinians with thousands more injured and disabled in another chapter of the ongoing Israel-Palestine conflict which the UN human rights chief described as a “wholly disproportionate” response to peaceful protest. WMC has issued statements and resolutions regarding the peaceful resolution of the Israel- Palestine conflict over more than a decade (and can show evidence of discussion from 4 decades ago) which cements its commitment on behalf of Methodists and Christians worldwide, to peace in the Middle East. The conflict and inhumane conditions, however, remain and escalate. A few short days ago Christians celebrated the feast of Pentecost, a renewed “call to action” by the Holy Spirit to take up our gifts and lead the way to transform the world. We need a radical response to love to create peace for all humans, made in the image of God – children of God. Peace requires justice, and justice demands action. Peacemaking is not silent or gentle or diplomatic but radical and transformative as Jesus’ actions were. Let us remind ourselves that “Blessed are the peacemakers for they will be called children of God” (Matthew 5:9 James NIV). As the conflict escalates, let us escalate our efforts to be peacemakers and stand with and for our brothers and sisters crying out in anguish. In this issue of the FFL you will read about celebrations in The United Church of Papua New Guinea, lessons from the life of Rev. Dr. James H. Cone, how flooding in the Congo has touched the lives of Methodists there, and an update on the tragic plane crash in Cuba which claimed the lives of 10 Nazarene pastoral couples. You’ll also hear how some churches in the U.S. are preparing for asylum seekers, how you can be involved in the Global Day of Prayer to End Famine, a celebration of the life of Revd Dr Colin M Morris, and how Wesley’s Chapel London remains relevant and active today. On behalf of the Officers and staff of the WMC as well as readers of the First Friday Letter, I would like to express our sincere thanks to Barbara Bowser as she transitions to a new job at the Foundation for Evangelism. Our prayers and best wishes go with her and her family.